How to copy words, phrases and lines quickly to clipboard by just one mouse click. How to avoid cumbersome two step text selection, then select copy. 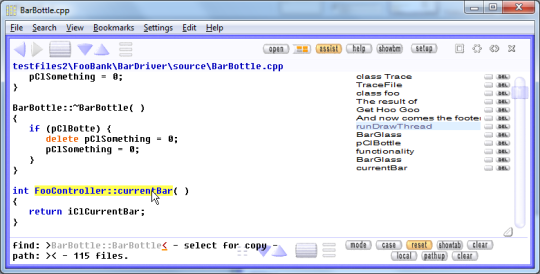 Use fast repeated copy from text with a Freeware tool for Windows and Linux/Mac. -  copy a full word. -  copy a phrase with multiple words. -  copy a whole line. -  copy a block of full lines. -  copy a character exact phrase. and two click quick copy of text blocks. -  press CONTROL and KEEP CONTROL PRESSED. -  LEFT CLICK into "FooController". or move the mouse over to "currentBar". -  RELEASE the CONTROL KEY. The phrase is now in your clipboard. any text editor does it. It is not possible to copy just a partial word like "Foo"
(except when entering text edit mode in DView Pro). 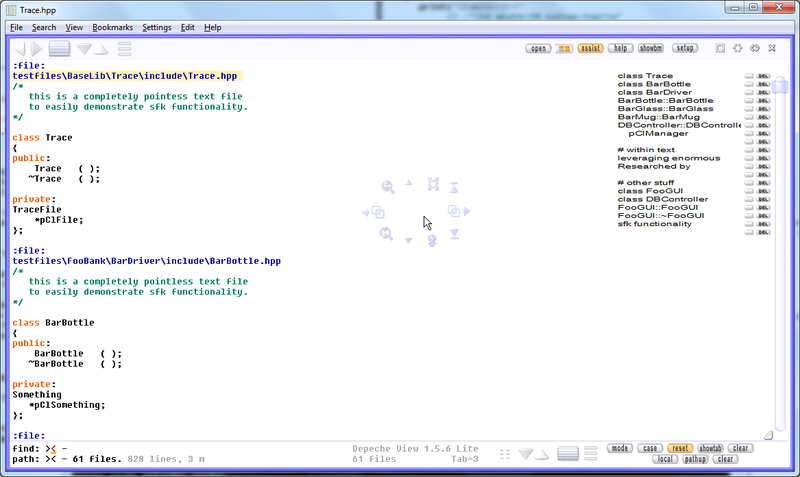 like on "::cur" or "(" in the example above. in which you are interested. to move through the text in page steps. -  LEFT CLICK into a word of the LAST TEXT LINE. all selected lines should appear in yellow now. -  the selected lines are now in your clipboard. to copy the whole line instantly to the clipboard. Blanks to the left and right are stripped automatically. currently visible on screen to clipboard. this will copy all filtered lines. the cursor looks like an underscore "_". -  then press SHIFT+INSERT (or CONTROL+V). to change the current file selection. by the clipboard text, so there is no need to clear it first. -  DOUBLE click somewhere into the find mask. -  the cursor changes from "_" to "|". -  now press SHIFT+INSERT (or CONTROL+V). the text is inserted into the existing search phrase. just double click into the mask again. use CTRL+HOME/END to jump through files.